Several countries have overlapping territorial claims to portions of the South China Sea, which stretches from Singapore in the southwest to Taiwan in the northeast. The Spratly Islands and Paracel Islands are two of the most contested areas (see dark blue islands on map above). However, unlike other parts of the South China Sea, these areas have not been assessed to hold large (conventional) resources of oil and natural gas. Under the United Nations Convention on the Law of the Sea, ownership of habitable islands can extend the exclusive access of a country to surrounding energy resources. 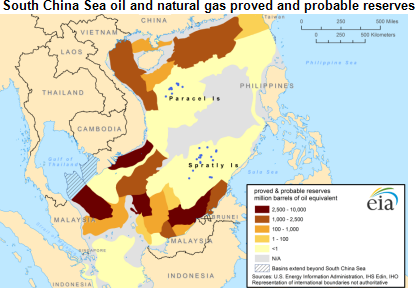 EIA's analysis shows that most fields containing discovered oil and natural gas are clustered in uncontested parts of the South China Sea, close to shorelines of the coastal countries, and not near the contested islands. Industry sources suggest almost no oil and less than 100 billion cubic feet of natural gas in proved and probable reserves exist in fields near the Spratly Islands. The Paracel Island territory has even less natural gas and no oil. In total, the South China Sea has about 11 billion barrels of oil and 190 trillion cubic feet of natural gas rated as proved or probable reserves. 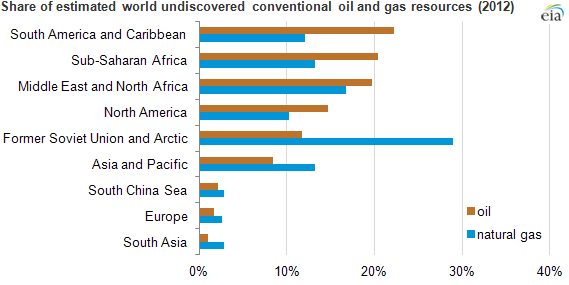 These levels are similar to the amount of proved oil reserves in Mexico and about two-thirds of the proved natural gas reserves in Europe, not including Russia (see figure below). *Note: South China Sea includes proved and probable reserves. In addition to proved and probable reserves, the South China Sea may have additional hydrocarbons in underexplored areas. The U.S. Geological Survey (USGS) estimated in 2012 that about 12 billion barrels of oil and 160 trillion cubic feet of natural gas might exist as undiscovered resources in the South China Sea, excluding the Gulf of Thailand and other adjacent areas. About one fifth of these resources may be found in contested areas, particularly in the Reed Bank at the northeast end of the Spratly Islands, which is claimed by China, Taiwan, and Vietnam. These additional resources are not considered commercial reserves at this time; extracting them may not be economically feasible. The Paracel Island area may also contain significant natural gas hydrate resources. While test drills are promising, commercial development of natural gas hydrates in the South China Sea is many years away given technological challenges and current natural gas prices. EIA projects Southeast Asian domestic oil production to stay flat or decline as energy consumption rises in the region, and natural gas from the South China Sea may meet a significant part of future energy demand.